In the second of my highlights from this week's London Design Festival, I look at two projects in which contemporary product designers have refreshed the output of two long-established manufacturers. 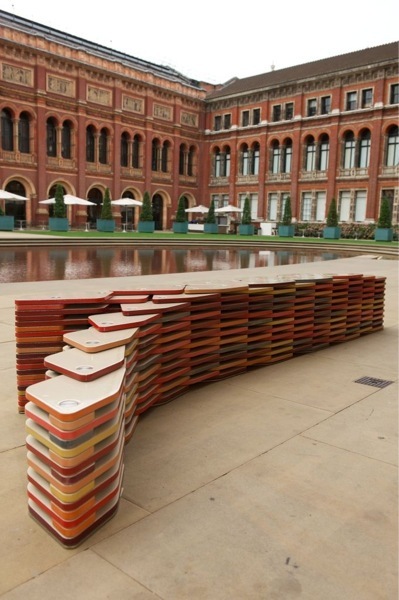 In the gorgeous Madejski Garden at the V&A Museum, UK furniture company Established & Sons have installed ten extraordinary one-off benches, each designed by an internationally acclaimed designer paired with a unique material supplier. My favourite is Bench of Plates by design and architecture studio AL_A, who collaborated with ceramic producer Ceramica Cumella from Spain. Ceramica Cumella was founded in 1880 in Barcelona, and originally produced traditional pottery for everyday use. Bench of Plates showcases a spectrum of glaze colours, as a reference to domestic dinner ware. The individually handmade ceramic leaves remind one of plates, tiles or shingles. These interlocking plates, as well as being visually arresting, allow the bench to be arranged in a variety of shapes. Bench Years is at the V&A Museum until Sunday, open daily 10-5.45pm. 70 year old Japanese furniture manufacturer and woodworking specialist Karimoku turned to creative director Teruhiro Yanagihara to introduce a wealth of new design talent to reinvigorate its collection. In 2009, a new brand, Karimoku New Standard, was created with the intention of combining traditional Japanese woodworking techniques with progressive technologies such as new surface and colour treatments. The company is committed to preserving and revitalising Japanese forests and local industry. It's products are predominantly made of solid Japanese hardwoods such as maple, chestnut and oak - timbers that previously ended up as wood chips for paper pulp. A selection of their tables, chairs, platters and coatstands are on display in Twentytwentyone's Upper Street showroom, including some prototypes for 2013. London Design Festival: Textiles for furniture.